NTN Corporation, one of Japan’s largest bearing manufacturers, said it plans to reduce the staff at its Japanese plants. The main reasons that prompted the company to take this step, called poor performance in automotive, bad price levels and “strong” yen. 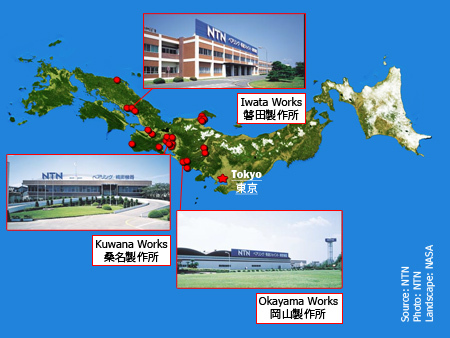 As of March 2012, at approximately 7700 employees working in Japan NTN. Including more than two thousand people working in large industrial complexes for the production and development of automotive parts in Okayama Prefecture and Shizuoka. NTN plans to cut about 700-800 people at Japanese companies, or nearly 10% of Japan’s total staff. Along with the dismissal of employees of the company will also stop some production lines. This will, by 31 March 2015 to cut costs by 50 billion yen. Currently NTN again after the crisis 2008-2009 is experiencing hard times. In the 1st quarter ending July 31, the company showed a net loss of 838 million yen. An automotive application, despite the increase in sales volumes, demonstrates a negative operating result. According to forecasts, in the first quarter of 2013, sales for the automotive industry may reach 91.9 billion yen, but operating profit dropped to minus 2.7 billion yen. Besides the problems on the financial front NTN also faced with legal issues. In 2011, NTN bearings and other companies have been accused of cartel to fix prices for bearing products in Japan. This case has already been considered in a court of Tokyo. And if the antitrust violation is proved, NTN may incur additional financial and reputational loss. In addition, anecdotal evidence against NTN was filed by one of the largest shareholders, presumably because of the prolonged fall in the price of shares and shareholder value.